It's been awhile since I wore this one and thought to take it out yesterday. Luckily, the date was stopped at 8 and would only need one turn to get to the 9th. It's one of two reasons why it doesn't get much wrist time. If your date is off by more than a couple of days, it will be a pain to cycle through the hour hand to get to the current date. That and my shift in preference towards black dials (why I stupidly sold my Milgauss RIGHT BEFORE all this crazy bubble happened. Yes, I took a bath with that unnecessary sale). The few times Marie Kondo-ing your collection can be a bad idea. Sure it may not spark joy, but it may spark a future profit down the line. Why sell when you don't have to.. probably that guilt complex of having expensive sh*t lying around. Whatever it was, it was a bad idea. What gave me a heart attack was thinking that I thought I set the time right. We were out to do an errand when I remarked that it was still early and had enough time to finish it. To which the gf remarked, "your watch is late by an hour". Now, this for some reason, happens to me regularly.. being off by an hour. Dumbfoundedly, I reset the time. An hour later, I checked the time and said that it was still too early for dinner. Lo and behold, she mentioned the time and I had to check mine again.. and there it was, late again by an hour. By this time, I'm telling my self that I couldn't be wrong twice in a matter of several hours.. that my watch was due for servicing (due for a second run probably as I had it checked in last 2011).. so that kind of ticked me off because I didn't exactly want to have to go to the other side of town for service. So I let it run its course and resigned myself to the fact that I had to visit the center at some point. During coffee, I told myself maybe I did make that weird mistake twice. So I had a go at it and changed it to the "correct time" so that I could monitor the deviation rate. It was running fine but just to be sure I wound it with 40 turns last night to make sure that it would have enough juice the next day.. I wake up and there she was, Rolex being Rolex. Humming perfectly, living up to its superlative monicker. I think it's me that needs fine adjusting to +/- 1 hour per day. Hehe all is well. Just thought I'd share with you something useless this fine Sunday morning. of an old Mercerdes App when the husband comes home late claiming a car breakdown and receives a slapping... same would happen here, blaming you're late on a Rolex...? That will work...not! Nico is right.. quite doable still.. I did not realize this. 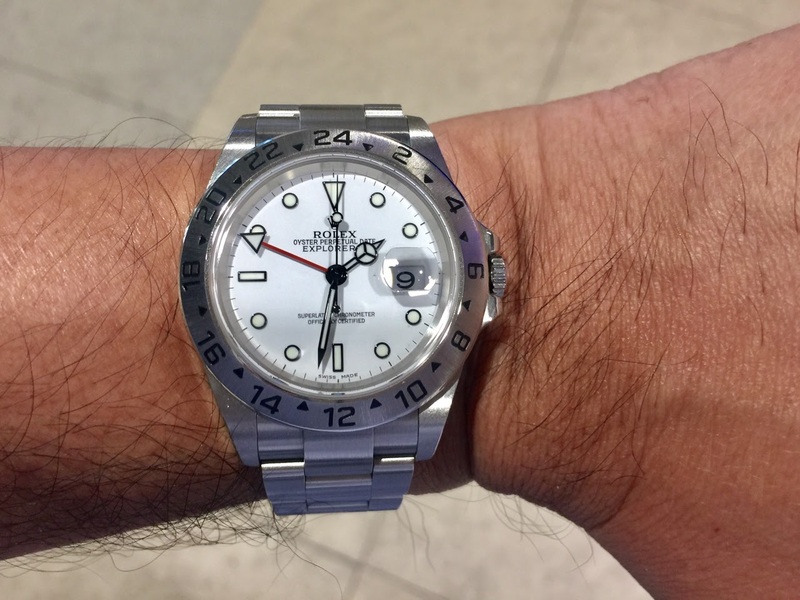 Do the newer models of Explorer II incorporate a quickset date? Still a watch worth setting no matter what time of month. Better yet, make it the daily go to. Thanks for bringing it out, Echi. No sir they didn't have a quickset date. I'm not sure about the new ones though. It's a cool piece going on 15 this year. The proportions are quite elegant whereas the new ones would seem more macho. Glad you like it!